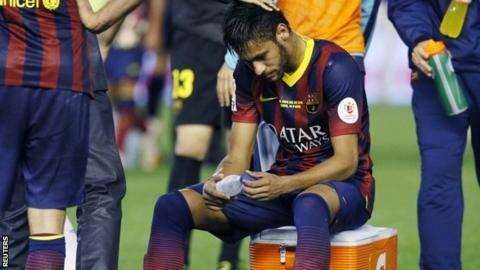 Barcelona striker Neymar will be out for four weeks with a foot injury. The 22-year-old Brazil international was injured in Wednesday's Spanish Cup final defeat by Real Madrid. The news of Neymar's injury completes a dreadful few days for Barca, who went out of the Champions League, slipped four points off top in La Liga and then lost the cup final. The first game Neymar will miss is Sunday's home game against fourth-placed Athletic Bilbao in La Liga. If he recovers on time, he will return for the final day of the season, when Barca host current league leaders Atletico Madrid, although their opponents could be crowned champions by then. Neymar joined Barca from Santos in the summer but his £48.6m transfer has been the subject of tax fraud charges against Barcelona. The forward is expected to be one of Brazil's stars in this summer's World Cup. The hosts face Croatia on 12 June, then Mexico and Cameroon. Barcelona: Short-term pain, but long-term gain? Read more on Barcelona: Short-term pain, but long-term gain?